Our ample supply of tomatoes this season came from our neighbor!!! He wanted to grow them more than consumer them, win-win. At the end of the season we had a huge bag of green ones. I used a few to make a sofrito for the freezer and left the rest in a shopping bag. A week later I noticed they were beautifully red! I'd do anything to avoid skinning a tomato by boiling/shocking, etc. I'm not sure where I read about this method, so I'll just say I made it up myself and thought I'd share it with you. Fast, no boiling, little waste. 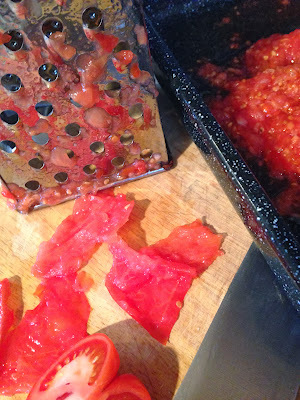 Cut the tomato to expose an unskinned surface, grate on a box grater, the skin stays behind. I froze the ground insides. 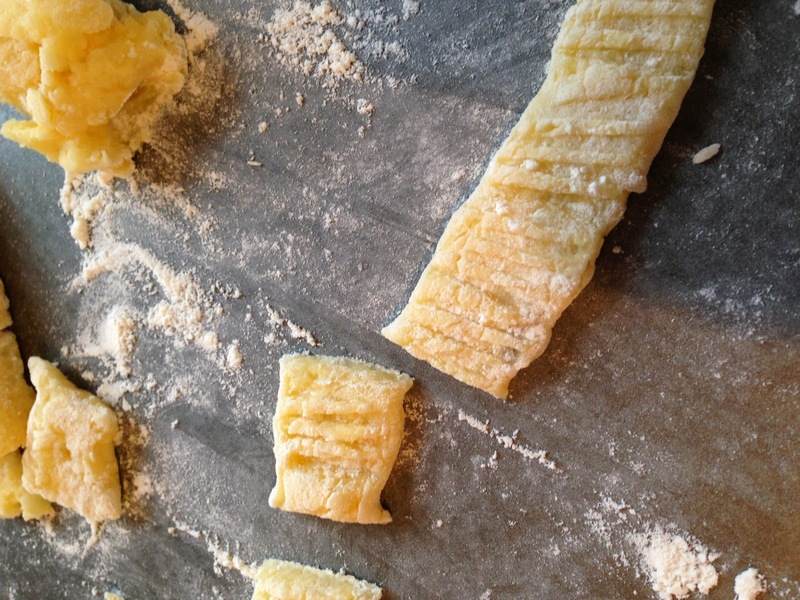 Gnocchi is about the potato. It is not pasta. I played with these last weekend and had some luck. 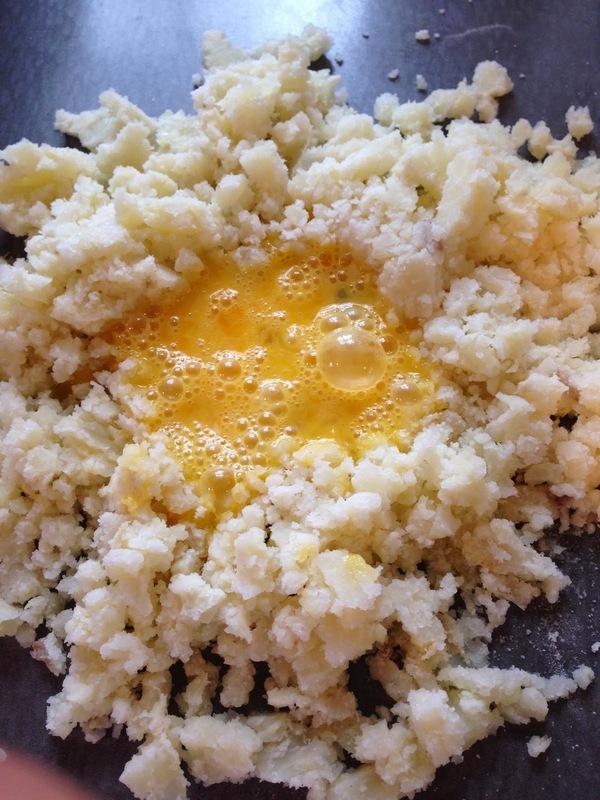 The general consensus for ingredients is a pound of baked potato (flesh only), an egg, pinch of salt and 1 C flour. Here's a few shots of my second attempt. I used 550 grams baked potato flesh (russets baked at 425 for an hour and scooped out while warm), 2 eggs, 1/2 t salt, and 3/4 C flour. 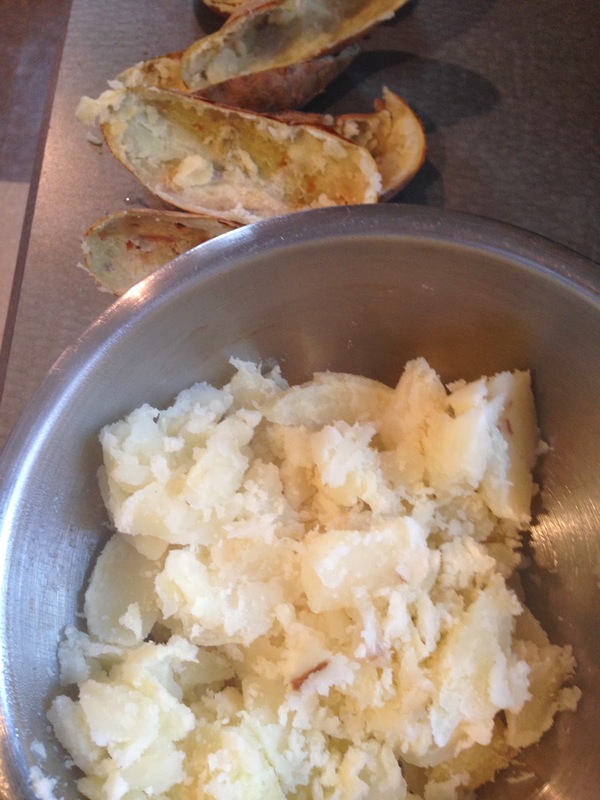 The baked potato and don't toss the skins! Rebake the skins and top them with stuff for a separate meal. A friend of mine uses yukon gold for gnocchi but my preference is the russet. 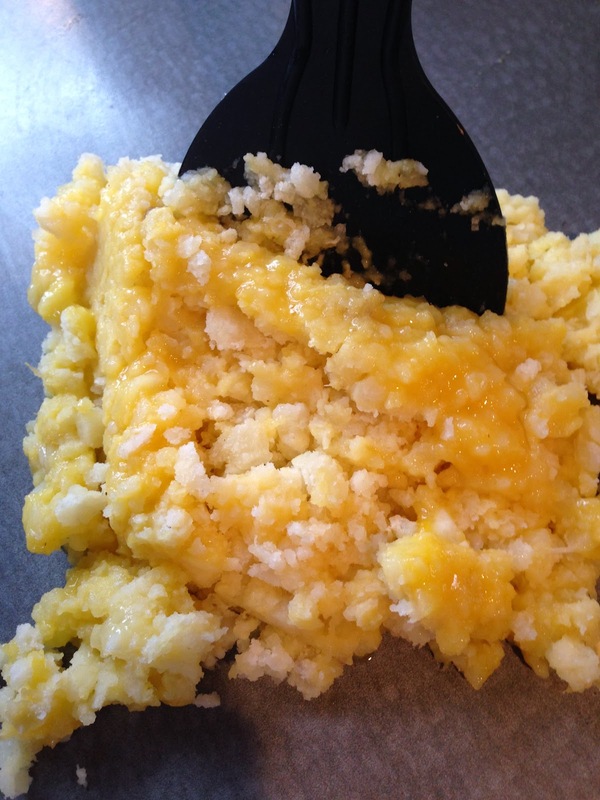 I plopped the potato on the counter, made a well and dropped my scrambled eggs inside. Sprinkled flour on the mass and cut in the flour using the spackle blade. Once the flour was cut in, I'd squash the mass a little, cut it in half, stack the halves and squash them lightly again. No real kneading, just pushing it all together. It's more of a biscuit dough than anything else I can describe. 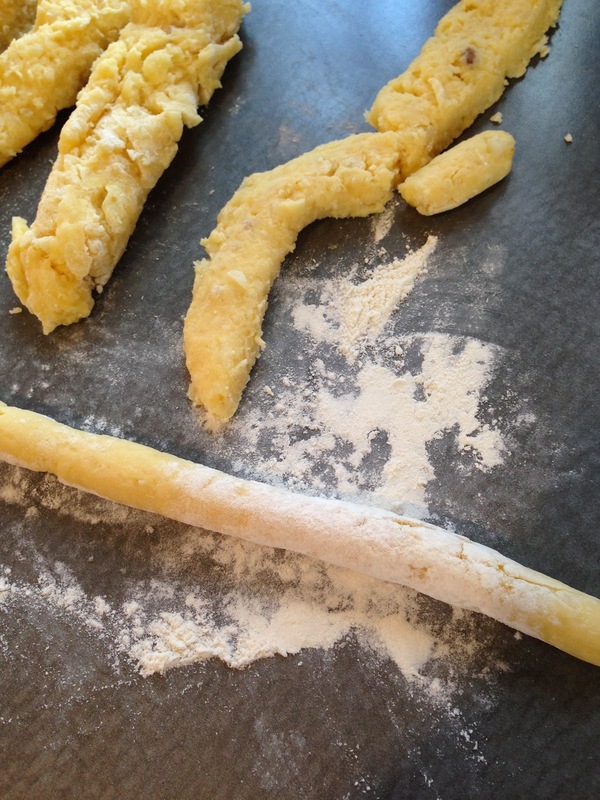 The dough was cut into little chunks, shaped into a small cylinder, rolled in some flour and *gently* rolled into a rope. This dough is sticky! 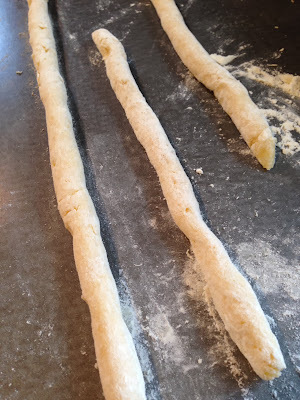 Use flour as needed to make it not stick in order to get the rope. With the tines of a fork, crimp the rope like the edge of a piecrust and then chop into small sections. 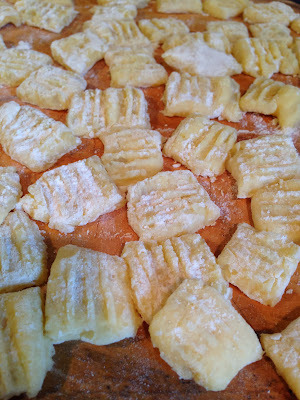 My gnocchi look like chex. A few more ropes about to be scored and cut. Toss these in the freezer to prevent them from being sticky. Dump in gently boiling water to cook. When they rise to the top, they're done. I served them with ham, peas, olive oil, salt, pepper. 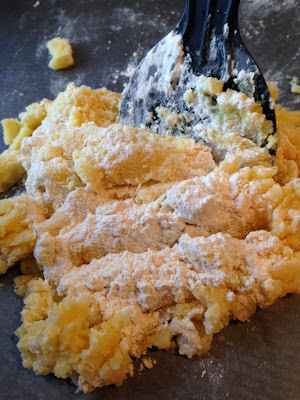 In retrospect, I should not have crushed the potato so much, a more coarsely crumbled potato gave a better gnocchi (taste and texture) and I would've used the full 1.2 C of flour this amount of potato would've called for.